WASHINGTON — Democratic attorneys general in 20 states and Washington D.C., the nation’s largest Latino civil rights group, and religious organizations and other nonprofits demanded Tuesday that the Trump administration halt its policy separating children from illegal immigrant parents. The demands came as congressional Democrats — joined by some Republicans — called for an immediate halt to the policy. Thomas A. Sentz, president and general counsel of the Latino civil rights group, the Mexican American Legal Defense and Educational Fund (MALDEF), went so far as to call for the resignation of Attorney General Jeff Sessions, the architect of the April “zero-tolerance” policy in which the government seeks to prosecute all illegal immigrants. “Our nation’s soul is at stake,” Saenz said. “The simple truth is that the Trump administration is, on a daily basis and on a scale that is horrific to grasp, terrorizing toddlers, traumatizing children, debasing family values, and assaulting the love of parents, all in the name of a grotesque ‘zero-tolerance’ that demeans every person involved. The outcry comes after the Trump administration announced Friday that in April and May, nearly 2,000 children have been separated from parents being criminally prosecuted for crossing the border illegally. 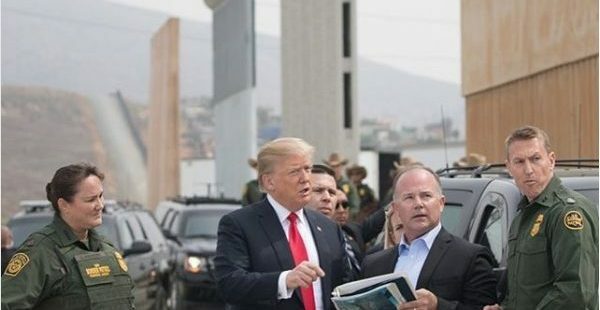 President Donald Trump, Sessions and Homeland Security Secretary Kirstjen Nielsen have defended the policy, and Trump has repeatedly blamed Democrats for the policy. But no federal law requires the government to separate children from parents being prosecuted as illegal immigrants. Republican governors of Maryland and Massachusetts — along with Democratic governors in New York, Rhode Island, Connecticut and Virginia – said they would no longer deploy National Guard troops to the U.S.-Mexico border unless the Trump administration abandons the separation policy. Also demanding an immediate end to the border-separation policy Tuesday: Leadership 18, a coalition of CEOs from the nonprofits, with a total of 87 million members. The coalition includes Catholic Charities USA, Lutheran Services in America, the Salvation Army, the Jewish Federations of North America, the United Way Worldwide, the American Red Cross and the YMCA. “Separating immigrant children from their parents when they come to the border should never be a part of American policy,” the coalition said in an open letter signed by the 18 organizations. “Put simply, the deliberate separation of children and their parents who seek lawful asylum in America is wrong. This practice is contrary to American values and must be stopped. We demand that you immediately reverse these harmful policies in the best interests of the children and families affected,” the letter reads. AGs in California, Connecticut, Delaware, the District of Columbia, Hawaii, Illinois, Iowa, Maine, Maryland, Massachusetts, Minnesota, New Jersey, New York, North Carolina, Oregon, Pennsylvania, Rhode Island, Vermont, Virginia and Washington state signed the letter to Sessions. Meantime, the American Civil Liberties Union said Tuesday it’s hopeful a federal judge in San Diego will end the separation policy. In a conference call with reporters Tuesday, ACLU officials noted U.S. District Court Judge Dana M. Sabraw on June 6 had refused a Trump administration request to dismiss the group’s legal challenge to the policy. Sabraw, who expanded the suit into a class action representing all families separated under the policy, said the policy could violate the U.S. Constitution’s right to due process. Sabraw wrote that the separation policy could violate the Constitution’s due process clause. The ACLU lawsuit began with an attempt to force the Trump administration to reunite an asylum-seeking mother and her 7-year-old daughter fleeing violence in the Democratic Republic of the Congo. They were been detained 2,000 miles apart for more than four months, the suit said. The mother and daughter had arrived in a port of entry near San Diego, where an asylum officer determined her fear of persecution was credible, the suit says. But she was detained at a detention center in San Diego while her daughter was sent to a facility in Chicago. The ACLU lawsuit cites what it calls violations of the Constitution’s due process clause, the federal law protecting asylum seekers, and the government’s directive to release asylum seekers.